CRYONOMIC® dry ice blasters offer many options to allow reliable integration into automated systems. In the tire industry, CRYONOMIC® machines have been integrated into several brands since 1998. Tire mould cleaning robots are based on customised electric pallet staplers. Such devices are active in many tire manufacturing plants worldwide; Germany, France, Italy, Holland, Poland, Portugal, Mexico, Russia, Romania, Indonesia, South-Korea etc. These machines used to be mechanically designed and built for a specific brand/type of tire mould. 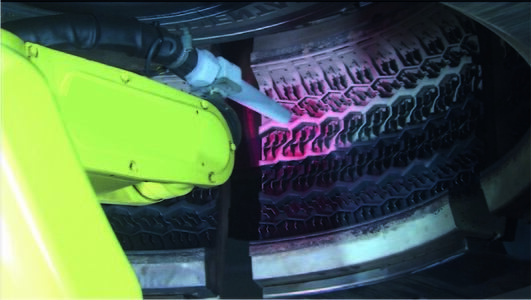 Nowadays the core of such a tire cleaning machine is a factory standard 6-axis robot that operates the cleaning tool manipulation, which renders these robot cleaners less expensive, more versatile, more effective and faster. Depending on the specific tire mould construction these robots can be equipped with an acoustic cover that reduces the sound levels of the dry ice blast cleaning down to below 85 dB. Let us know if you are interested and wish to have a demonstration.